If you are in need of air conditioning and heating services in The Woodlands, TX, call 281-704-3696 today for fast, expert service at affordable prices. We will set you up with an appointment so one of our specialists can inspect your system and provide you with the most practical solution. Click here to access our current coupons and specials. A quality heating and cooling system makes your home run smoothly, and finding a high quality service provider for repairs and installation helps even more. At Affordable American Air Conditioning & Heating, we provide expert, dependable HVAC services that will allow you to relax and live your life without having to worry about what’s going on with your heating or cooling system. Curious to see what your neighbors in The Woodlands and surrounding areas are saying about our heating and cooling services? Click here to find out! Affordable American Air Conditioning & Heating is a veteran-owned HVAC service provider that operates in The Woodlands, TX and surrounding communities. We are qualified to deal with virtually any heating or cooling situation, and we always operate with your whole-home comfort in mind. Texas is known for its blazing heat, but cool nights during winter months require a quality heating system. If your furnace isn’t running at full capacity and is showing signs of wear and tear, all you need to do is call and we will provide the repair or replacement service you need. Do you have an efficient AC system in place? Intense heat for much of the year means your cooling unit has to work overtime to keep the house comfortable. If you have no air conditioning for even a few hours, the results can be serious, especially if there are young children or elderly people in the house. At Affordable American Air Conditioning & Heating we offer dependable AC repair and installation services, plus attic efficiency services that will allow your cooling system to do its job. No matter where you are located within our service area, we will provide you with the highest quality HVAC solutions and customer service during every visit. 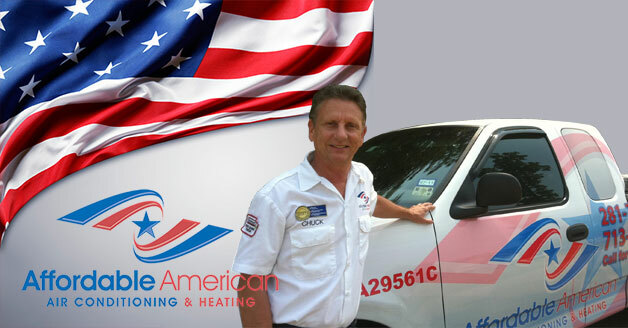 Just call Affordable American Air Conditioning & Heating at 281-704-3696 and we will get the process started.